Just when you think your driving adventure in Alaska can’t get any more remote or lonely, you come upon a road like the Denali Highway. There it is, cutting across the loop made by the Parks, Richardson, and Glenn Highways — three roads which already have their share of desolate, sparsely-populated areas. There isn’t much in the way of civilization in the middle of that loop. There isn’t even much in the way of asphalt. And that’s why it’s a really great place to retreat even further from the world. The Denali Highway’s eastern terminus is at Paxson, Alaska. It’s the kind of place where you’d expect to find a gas station, but will be sorely disappointed. Paxson is at the junction of Denali Highway (Alaska Route 8) and Richardson Highway (Alaska 4). Yes, in a state that only has about a dozen numbered highways, two of them meet here, and there isn’t so much as a single pump. 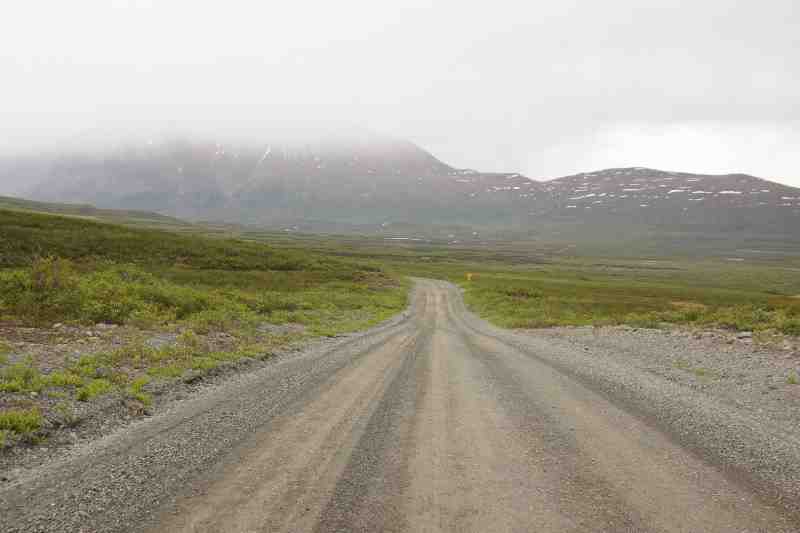 Denali Highway runs west from Paxson over to… you guessed it… the Denali National Park area. It was the original access road to the park. 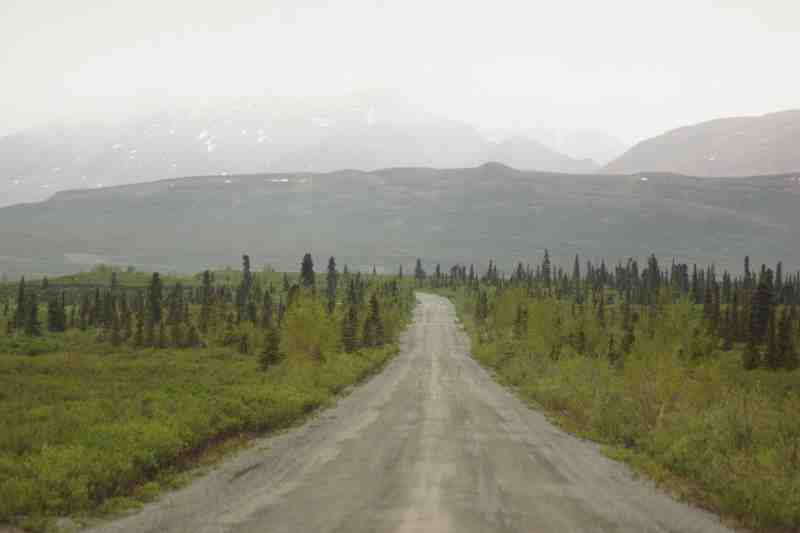 Now, Highway 8 ends at Cantwell, Alaska, and Highway 3, the Parks Highway. This junction is big enough to have a gas pump, thankfully. You may also get lucky and find gas at some very small stations somewhere in the middle. Or maybe they’ll be closed. Good luck. I was already enjoying a very nice, scenic drive down the Richardson Highway, as I made my loop around the aforementioned Alaskan roads, when the Denali Highway called to me. I had started the day in Fairbanks, spent some time at Santa’s house in North Pole, and checked out another notable pole at the end of the Alaska Highway, up the road in Delta Junction. My day would end in Gakona, not far from where the Richardson and Parks Highways meet. When I reached Paxson, I figured I had enough time to detour for a while, and explore at least part of the Denali Highway. I also figured I had enough gas. At least I was right about the time. 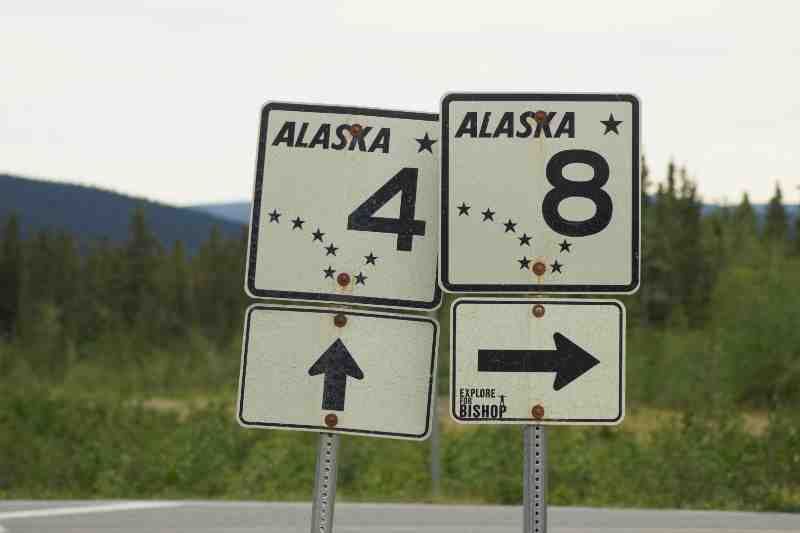 I’m pretty sure there are only about 4 signs for Alaska 8 in existence. Two at each end – one for northbound traffic, the other for southbound drivers. Highway 8 doesn’t intersect anything else in between, and Alaskans really don’t use these numbers anyhow, so get your photos here. 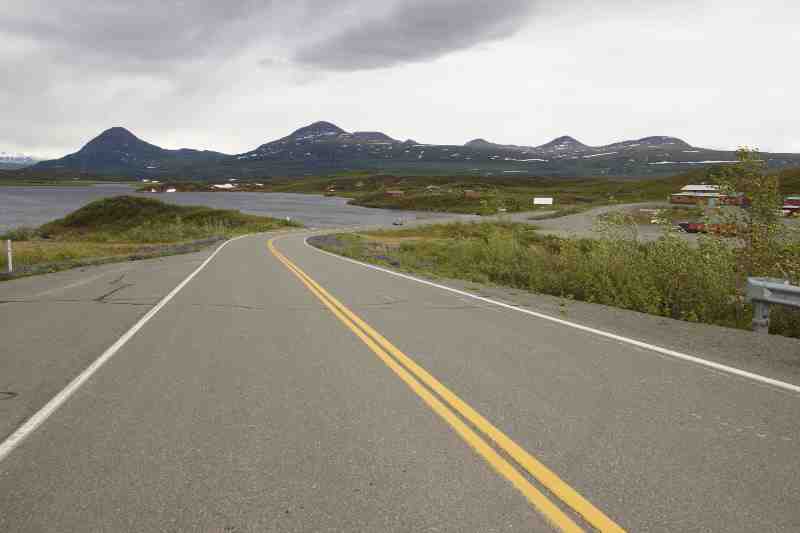 The Denali Highway provides pavement at first, as the road plunges into the wilderness. Viewpoints are innumerable, even on days like this one, when clouds and occasional sprinkles were attempting to hide some of the road’s beauty. Not far in, watch for an interpretive sign at the side of the road. If you’re lucky, it will be stocked with brochures that include a helpful map of the road’s major landmarks. … which is a small settlement at the edge of Tangle Lake — near the headwaters for the Delta River (earlier, it ran alongside the Richardson Highway). There might be gas here, along with lodging at the Tangle River Inn. Moments after passing Tangle Lake, the pavement ends — and if you’re going all the way, you won’t see blacktop again for more than a hundred miles. Just three miles of highway are paved at the Cantwell end. A lack of pavement isn’t a big deal, though. If the road is snow-free, you should find it to be in pretty good condition. You should check locally for road conditions, of course, but upon my visit in early June, the surface was smooth and solid, with no snow or ice. The views are great in every direction. 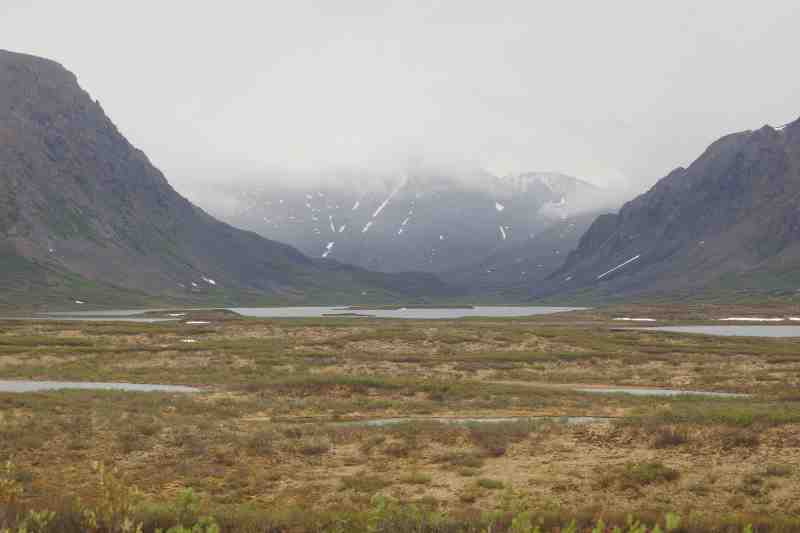 Here you see a valley, untouched by any kind of road. Is anyone home? I didn’t knock on the door. It’s quite a location, though. As the miles ticked by, I consulted my BLM brochure and decided I would go as far as point #9, the Maclaren River Viewpoint. This spot is 37 miles from Paxson, and 18 miles beyond the end of the pavement. And as viewpoints go, it’s pretty darned good. The elevation marker is also significant. 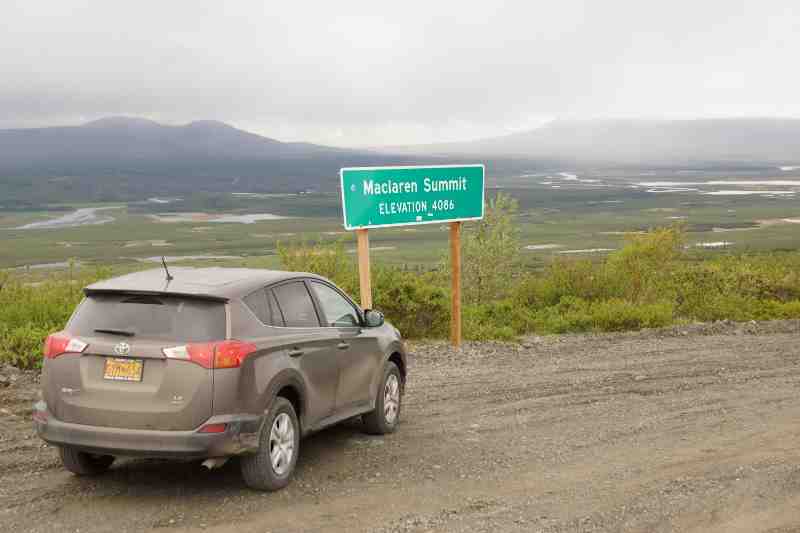 At this wide-spot at the side of the road, you’re just beyond Maclaren Pass, or as the sign calls it, Maclaren Summit. The elevation reads 4,086 feet, which makes this the second highest pass on the Alaska highway system. 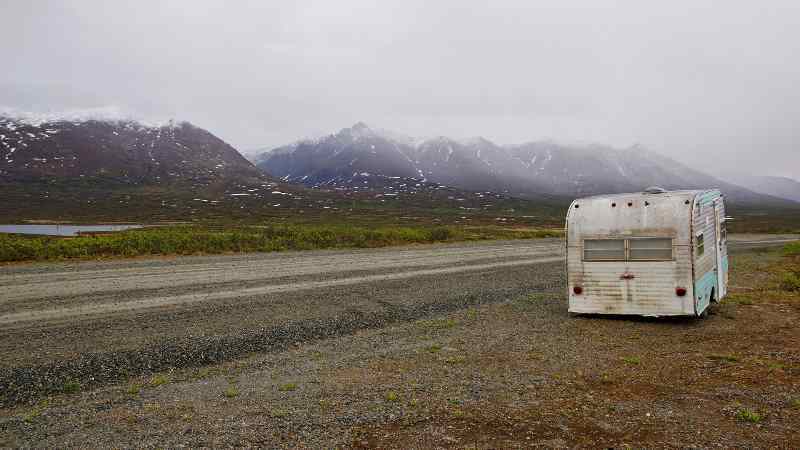 Fun Fact: The highest highway pass in Alaska is Atigun Pass, on the Dalton Highway. If you’ve ever watched Ice Road Truckers, you’ll remember that scary ice-covered mountain they’re always trying to cross, accompanied by dramatic music, tight camera shots, and abrupt commercial breaks. That’s Atigun Pass, elevation 4,800 feet. 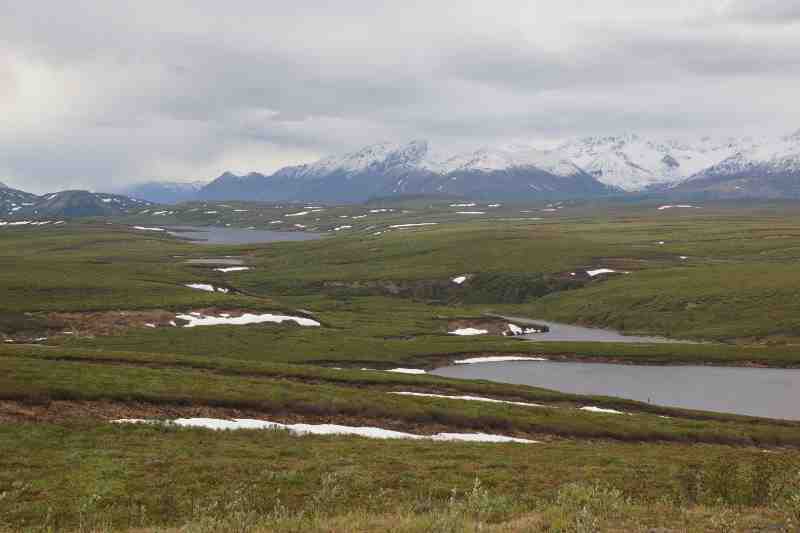 I would have loved to have kept driving, and covered the entire length of the Denali Highway. I promise, I’ll do it someday. But on this day, I couldn’t go any further. I turned around at Maclaren Summit and backtracked to Paxson. All the way, I was thinking, I’m sure that one building at the junction had a gas station, right? I mean, it had to! I probably just didn’t see it. Of course, when I got to Paxson, the building was abandoned. I didn’t even see any gas pumps. Suddenly I became aware that my detour had added about 74 miles to my trip. In other words, it had burned about 3 gallons of gas. The fancy digital readout in my SUV told me I had about 60 miles of gas remaining in my tank. That’s funny, I thought, because it was about 60 miles to Gakona. Suddenly, picture-taking and adventure-seeking were done for the day. I set the cruise control at a very steady, conservative speed, and occasionally shifted into neutral to coast down hills. Somewhere along the way, I found one business that was open — but the pumps weren’t working. The clerk recommended another place, about 20 miles down the road. When I got there, it was closed. My fate was almost sealed. There was nothing I could do, but drive for another half-hour or more, calculating the remaining miles and the potential miles per gallon, and wonder if I would make it. When I arrived at my accommodation for the night, the Gakona Roadhouse, my vehicle said I had 5 miles of gas remaining. That wasn’t even enough to get to Glennallen, the nearest town. Fortunately, the roadhouse owner had some fuel to spare, and sold me a 5-gallon container. The lesson? Fill up your tank in EVERY big town. You never know when you’ll want to take a 74 mile detour into the middle of nowhere. If you can, drive the entire Denali Highway. It’s probably more interesting than the drive on up to Fairbanks. If you don’t have time to do it all, just drive a small portion of the road. It won’t disappoint. And for goodness sake, get gas first.